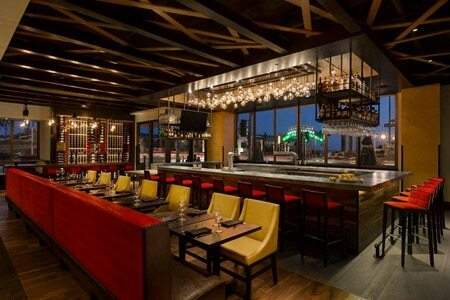 An American bar & grill concept, with a view, from the restaurant group behind Del Frisco's Double Eagle Steak House. Open Mon.-Fri. 11 a.m.-11 p.m., Sat. 10 a.m.-11 p.m., Sun. 10 a.m.-10 p.m.
About the restaurant: There are great spots and there are prime ones. It’s the latter for the Santa Monica location of Del Frisco’s Grille: right across from the entrance of the historic Santa Monica Pier. Yes, we like the modern design of the interior, which creates a vibrant atmosphere with its central bar, communal tables, the open kitchen and its wood-oven. However, sitting on the patio on the iconic Ocean Avenue overlooking the neon sign of the pier with the solar-powered ferris wheel for a backdrop is a real treat, even if you are a local. Dislikes: Not sold on the coffee-braised pork shank.